Is your little girl an aspiring Victoria Stilwell? Help her spread the word about changing dogs' lives Positively! 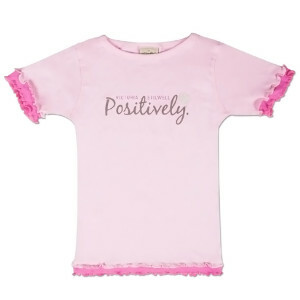 This high-quality, 100% combed ringspun cotton girls' T-Shirt features cute contrast ruffles on the sleeves and waist, and was personally designed by Victoria and her daughter. Available in Pink with Raspberry ruffles. This shirt will shrink slightly with regular washing - if between sizes we recommend choosing the larger size. 5.8 oz, double-needle stitched reverse rib binding on neck.